Martha's latest kitchen collection at Macy's is all about farmhouse rusticity with a modern edge. 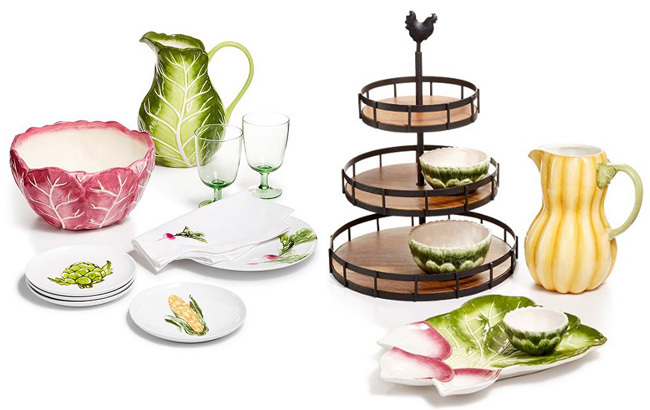 The Farmhouse Collection boasts a wide selection of serveware, dinnerware, table linens and glassware. You can combine it all for a charming country style or introduce a single piece (or a few) into your current collection of kitchenware to add some farmhouse flare. Below are some examples from the collection. The collection has serving pieces that are reminiscent of old-world Majolica: pitchers and serving dishes take on the whimsical appearance of vegetables from the garden. A three-tier serving tray topped by a chicken would make a nice centerpiece to a rustic table, proffering condiments or hors d'oeuvres. 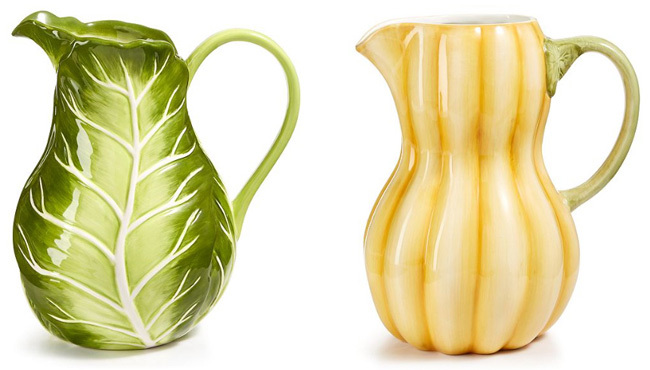 The Farmhouse Cabbage Pitcher and the Farmhouse Gourd Pitcher each stand ten inches tall. Both are made of Dolomite (a sturdy form of limestone that is often used in ceramics) and are microwave and dishwasher safe. Among my personal favourites from the collection are these beautiful green-glass goblets and this artichoke-shaped lidded serving dish, which is also made of Dolomite and measures nine inches in diameter, standing five inches high. 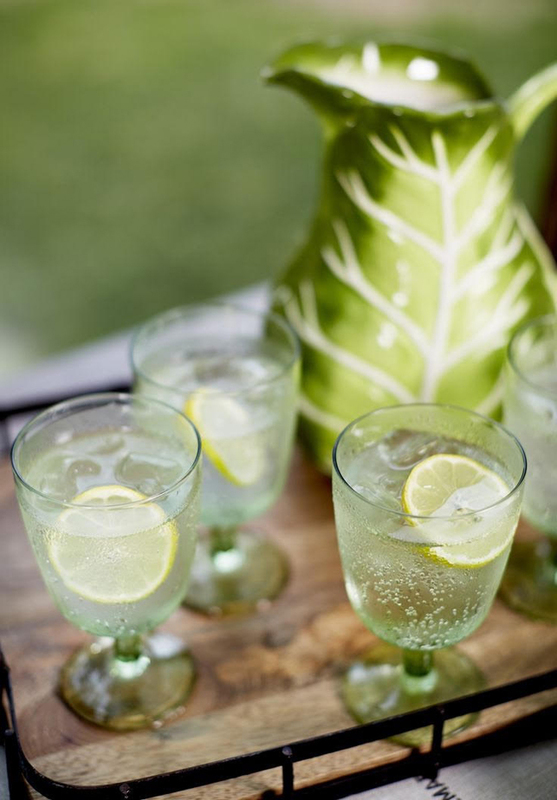 The glasses, made of soda-lime glass, stand approximately six inches high and come in a set of four. I think they're so pretty. 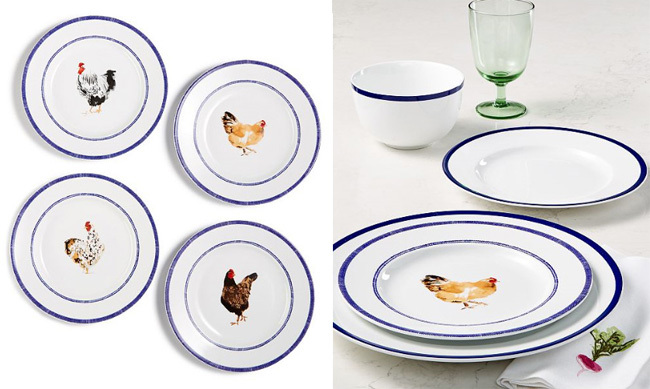 This set of four side plates featuring painted chickens is a study in pure whimsy. The navy borders give the plates a modern feel. The set of three mixing bowls features herb motifs painted on the insides of the bowls, including parsley, thyme and basil. This radish-motif plate is part of a set of four side plates featuring paintings of root vegetables. Nothing says farmhouse quite like the noble chicken. 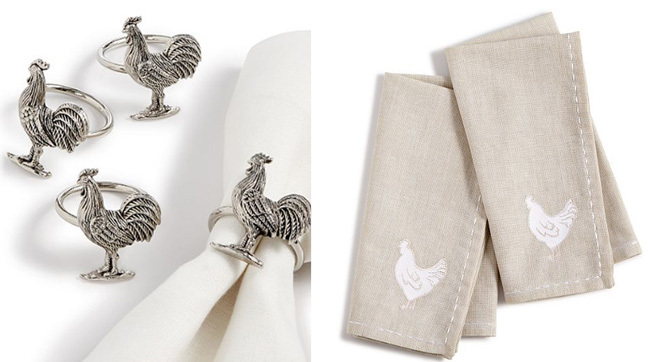 The set of four napkin rings (made of zinc alloy) perfectly complement this set of two cotton napkins with white stitching and chicken motifs. 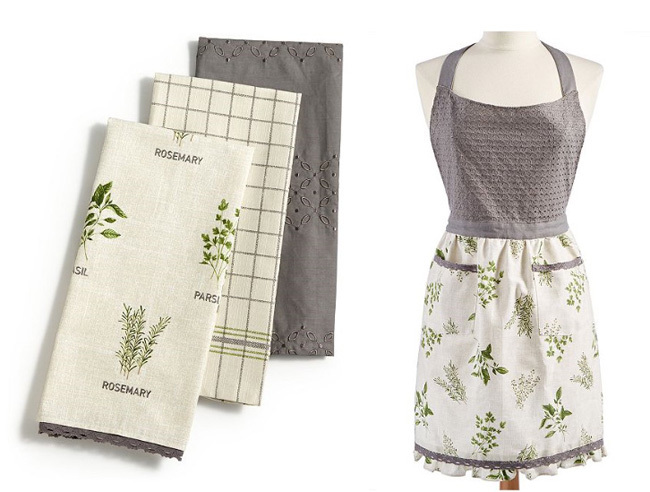 A set of three cotton tea towels coordinates perfectly with a pretty cotton apron of the same herb-laden motif. Pockets and a delicate fringe along the hem give the apron a vintage feel. TO SEE MORE AND SHOP THE COLLECTION CLICK HERE.